Rotary District 5890’s District Governor Nick Giannone joined us with his wife Fabiola, Asst. DG Jim Payne, DG Elect Eric Liu and wife Sandra. He helped induct the two newest members to the club, Marquie Fontenot and Michaela Filla. DG Nick also recognized Asst. DG Gary Gillen with his 5th Paul Harris Fellow pin. The ‘Presidential Citation’ was awarded to the sponsored Interact Club at Lamar Consolidated High School. 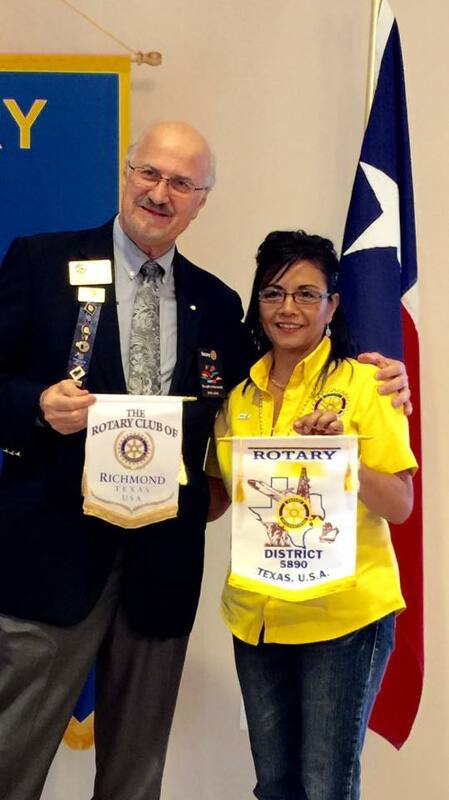 This award covers Richmond Rotary’s year 2014/2015 under the leadership of Past President Priscilla Salas. Introduced by Assistant District Governor Jim Payne, and joined by his wife Fabiola, District Governor Elect Eric Liu and wife Sandra, Rotary District 5890’s District Governor Nick Giannone inducted the two newest members to the club, Marquie Fontenot and Michaela Filla. Receiving Rotarian of the Month was Membership Chair Eric Junker. Nick also recognized Rotarian Gary Gillen with the presentation of his fifth Paul Harris Fellow pin. The Paul Harris Fellow recognition acknowledges individuals who contribute, or who have contributions made in their name, of US$1,000 to The Rotary Foundation of Rotary International. “To have our Lamar High School Interact Club receive such a prestigious award is a testament of the caliber of students within the school district. It's very rewarding and we are delighted to see our students excel,” stated President Liz Moreno.